Just up the hill from this Plenary's meeting-site sits one of American Catholicism's most venerable and extraordinary spaces – what's now called the Gibbons Room of the Baltimore Archbishop's Residence (above). Added onto 408 N. Charles in the mid-19th century, with John Carroll's chair in a corner and the croziers of the nation's first two archbishops flanking the fireplace, one can almost feel the ghosts of prelates past emerge from the walls... because, here, the tradition of collegial governance on these shores finds its roots – first in the provincial and plenary councils held within this spot, then the annual meetings of the American archbishops into the early 20th century. Today, that long tradition takes its latest turn with the election of the next head of the Stateside bishops, a democratic innovation only dating to the mid-1900s. As only happens every dozen years, however, this vote comes directly on the heels of the ascent of a new occupant of the "other" White House, with whose administration the next President of the United States (Bishops) will call the shots on the response of the nation's largest religious body. 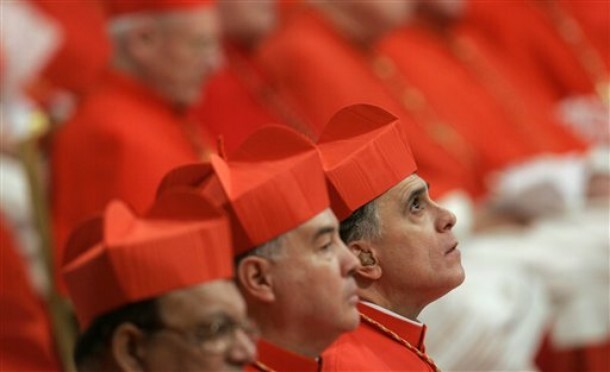 Keeping the inviolate custom of the body of bishops – well, almost – every indication in the house remains that the sitting Vice-President, Cardinal Daniel DiNardo of Galveston-Houston, will duly be elevated to the chief's seat. Yet even as the outcome is hardly in doubt, the "Reluctant Prince" wouldn't be himself if he weren't entering as a reticent president. Indeed, for most of this year, indications from Houston more than hinted that – having felt considerable qualms about the time-commitment required for the national job – the 67 year-old Curial veteran who happily fled home to Pittsburgh to begin a suburban parish from two rooms in an office-park was significantly tempted to decline the body's nomination, only bowing to accept his place on the slate at the last minute, and only after no small amount of pushing from others. That context is key to the decision ahead as the dynamic of each executive team is fluid, and its effectiveness depends on the balance of personalities who comprise it. Along these lines, according to estimates from Louisville, Archbishop Joe Kurtz's three-year term saw some 40 percent of his time taken for USCCB work – and that amid a local church of 240,000 Catholics. Given the needs of Houston's sprawling, 1.6 million-strong (and growing) fold – and all of one auxiliary to help with it all – well, do the math.... But despite all the ink that's been spilled over the de facto choice of Vice-President (elected from the other nine nominees), the decision the bench faces is neither one of ideology nor the potent specter of the Pope, but the ideal type to fill out the ticket: in a nutshell, is the moment best served by a next President-in-Waiting who's more of a messenger or a manager? To be sure, there are compelling arguments on both ends – on the former front, the impending reality of a Trump administration and a more general sense of trouble in the land (and, indeed, among the pews) on any host of fronts could be deemed as demanding a standout voice to advocate for the confused and fearful, then carry the baton come 2019... or, from the latter side, with an incoming bench-prez who can use a hand with the workload – and quiet, yet significant talk around of potential tweaks that would make the conference's processes more reflective of Francis' amped-up synodal vision for the church – is a figure who can "land the plane" and keep things moving over a six-year frame a more ideal fit? That said, the two aren't mutually exclusive, and in general the VP and subsequent chair-votes are far less cut-and-dried than the result of an algorithm of place, personality and skill-set, multiplied by some 270 electors. This time around, the options for the #2 post are formidable, each bringing a wealth of experience and talent – the only question is which "package" best fits the task and the time: the consummate "conference man" and barometric center of the body's reaction on any given topic, whose success at healing his hometown church has expanded into a push to rid the discourse of its "evil spirit" (Aymond); depending on one's worldview, the bench's provocateur/prophet-in-chief, his second New York Times bestseller soon to hit shelves even as the fires to be battled at home never seem to let up (Chaput); an energetic, upstart metropolitan formed in a stewardship church, whose "conservative" reputation has kept the body's beloved CRS protected from politicized attacks (Coakley); the "crossover" poet of the Texas Borderland, already become a seasoned hand in the top rungs at 55, balancing it with the life of an erupting 1.7 million-member fold – most of it younger than 25 – leading it all on his own (Flores); the head of the largest diocese these shores have ever known, whose own immigrant story, and that of his people, stands as the most potent counter-witness to the age of Trump (Gomez); the heir of Carroll, Gibbons and Hickey who's overseen the bench's long fight to defend the church's "first freedom" (Lori); the native of the Motor City – and a certain Eternal one – currently leading his hometown church on its own synodal walk (Vigneron); the ultimate "man alive" – Miami's hometown pastor for all seasons (however one says it in Kreyòl)/spiritual son of John Paul II/Stephen Colbert guest, who's never seen a china shop he wouldn't want to run his Harley around in (Wenski); or the embodiment of suaviter – the protege of a CDF prefect and Stateside Catholicism's liberal lion, now become a conference heavyweight in his own right (Wester). Again, it's a rich field – and as these results inevitably come down to a handful of votes and a 53-47 split (at most), when it comes to "polls" or projections, at least some of us have been around long enough to not even try calling it. The balloting begins shortly after 9am Eastern – and as ever, the livefeed will be here. However the brothers choose, may they simply choose well.